Going to a Demo Day is one of the best ways to test the latest gear available. In addition to getting a feel for newest sticks on the market, you can get expert technical advice from the person conducting the demo day, and even compare side-by-side how your current clubs performs against recommended clubs. But just rocking up and banging out balls willy nilly is not necessarily the best way to evaluate the effectiveness of a golf club. 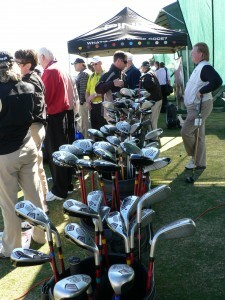 In fact, there are many common mistakes that most golfers make when approaching a demo day. The first mistake is usually upon arrival, where most golfers – in their excitement to hit the newest Big Dog — forget to warm up first with some iron shots. 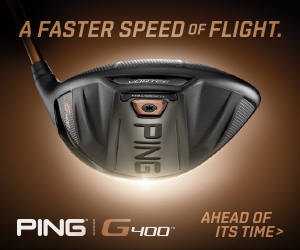 “On most occasions golfers go straight for the driver and start hitting. This can leave them with negative thoughts because they haven’t warmed up,” says Daniel Marsh – Fitting Specialist for Callaway Golf South Pacific. “In addition, golfers usually judge distance with clubs they are trying at Demo Days, but this is generally a false indication as most ranges used limited flight balls that don’t go as far,” he adds. Another common mistake is choosing the wrong equipment to demo. With so many models and brands to choose from, golfers sometimes just grab the one that “looks” the best. But this can lead to disappointment. “Hitting ball after ball using the wrong club is one of the most common mistakes golfers make. The golfer needs to be educated by an expert on what specification golf club best suits them, and then demo that specific club,” he adds. This sentiment is echoed by Adam Nance, NSW Tech Rep for PING. Nance has seen many golfers approach a Demo Day with the wrong mindset. “Golfers need to ask what they should be using. A lot of times golfers come to a demo day, and they have already done the research on the internet and they presume they need a particular club, but in a lot of the cases they need a completely different club,” Nance explains. “Because they have been using a certain driver in the past – say 9-degrees—a golfer expects that they want to be hitting the same 9-degree loft again,” Nance says. “A lot of people presume that to get more distance they need a lower loft, but 99 percent of the time they need to go to MORE loft. And as the clubheads have gotten bigger in the drivers over the years, we’ve had to introduce more loft to get the ball into the air. So they have been using an older driver, say 400cc’s, now all the drivers are made at 460cc’s, and they need to gather more loft,” he adds. Beyond the driver, choosing the right iron sets or combinations is also important. “Getting the right loft, shaft and lie angle is critical in irons, as is getting the right iron set combination,” Nance says. “Should you hit a 4-iron or 4-iron hybrid? The ladies, for example, as their clubhead speed slows, they basically hit those clubs the same distance. By asking the technical expert at the Demo Day, they can discover which club fills the correct ‘gap’ in their distances, and thus is best for their game,” he says. “People presume that the standard shafts aren’t as good as the aftermarket shafts, but at PING they are probably better, because they have been designed for the actual golf club,” Nance explains. While Demo Days are certainly useful for the majority of golfers, manufacturers are beginning to focus more on Fitting Days. This is a more in- depth process as technical representatives use a launch monitor to best help you choose the right club for you. Fitting days are usually run by appointment only, can take around 20-60 minutes, and you get the full attention from the fitter.